A1 Property Management offers your family, or small group, a selection of vacation homes and condos in both Carolina Beach and Kure Beach. All of our vacation rentals are fully equipped and ready to have fun. Most have oceanfront decks and balconies, access to a community swimming pool or private pool, and access to the sandy beaches of the Atlantic. 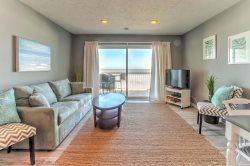 All of our vacation rentals come with the promise from our family to help you have the vacation that keeps you returning to Carolina Beach and Kure Beach year after year. Relax - enjoy the beaches and piers, the history and the activities along the boardwalk, and call us for any help you need having fun. David and Chelsea can be reached at (910) 409-6687. Stay with us in Carolina Beach or Kure Beach and enjoy our miles and miles of uncrowded beaches, old-time beach charm and unique Southern history. We have a wide selection of vacation rentals including vacation homes and condos. Call us today and lets help you plan the type of vacation that will keep you and your family returning to Pleasure Island year after year. Welcome to the family friendly town of Carolina Beach. Miles and miles of beautiful sandy beaches with warm water and perfect surf. From Britts Donuts to Franks Pizza to Squigglies Ice Cream - we have it all! Welcome to Kure Beach - where you can enjoy a quiet, laid back vacation and take long walks on the beach. We are toward the end of Pleasure Island yet close enough to all the shopping and sites of Carolina Beach. And with the NC Aquarium and historic Fort Fisher at your doorstep, the fun never ends. There is nothing like waking up to the sight of the sun rising over the ocean. Relax out on your deck with a cup of coffee and watch the dolphins swim by. Oceanfront - it cant be beat. Catch a glimpse of the ocean, just a short walk away and priced competitively for the whole family to enjoy. Having an outdoor pool during the summer is a nice bonus when staying at the beach. Sometimes you just want to relax by the pool. Maybe spend the mornings at the ocean, come in for lunch, and then relax (nap) by the pool in the warm afternoon sun. Sure beats working. Wow, an indoor heated pool to enjoy all year round. Dont forget to bring your bathing suit! Welcome to Ocean Dunes Resorts where amenities matter. We have a Rec Center with an indoor heated junior Olympic pool, whirlpool, saunas, locker rooms, gym, basketball court, tennis courts, shuffleboard court, and a playground for the kids. We are open year round so come anytime. Also, during the summer we have three large outdoor pool to choose from. Youll be glad you booked your beach vacation at Ocean Dunes. We offer a number of dog friendly homes to choose from. A vacation is not a vacation without the ENTIRE family! Just what the Doctor ordered - an elevator to help you bring all your stuff up to your beach vacation rental! It sure is handy to have. And after a long week of fun, its sure handy when you have to bring everything back down to the car. During the summer, Saturday check ins are at 3 or 4 pm and check out is the following Saturday by 10 am. During the summer, Sunday check ins are at 3 or 4 pm and check out is the following Sunday by 10 am.